For other uses, see Glycerius (disambiguation). Glycerius (Latin: Flavius Glycerius Augustus) (c. 420 – after 480 AD) was a Western Roman Emperor from 473 to 474. Elevated by his Magister militum Gundobad, Glycerius was rejected by the court at Constantinople and ousted by Julius Nepos. He later served as the bishop of Salona. Sources on Glycerius are scarce and scanty. It is known that at the time of his elevation to the throne he was the comes domesticorum, the commander of the Imperial guard of the court at Ravenna. Previous to this posting, he had been the military commander in Dalmatia. In 472, the Western Roman Empire was plagued by a civil war between Emperor Anthemius and his Magister militum (commander-in-chief of the army), Ricimer. Ricimer killed the Emperor and put Olybrius on the throne, but in a short time both Ricimer and Olybrius were dead. The Eastern Roman Emperor, Leo I the Thracian, tarried in choosing his successor, so the Germanic elements of the army, represented by the new Magister militum and Patrician Gundobad (a nephew of Ricimer's), elected Glycerius Emperor on March 3 or 5, 473 in Ravenna. Little is known about the short reign of Glycerius. In his biography of St. Epiphanius, bishop of Pavia, Ennodius states that Glycerius made "many measures for the public good" but mentions only that he pardoned "the injury done to his mother by certain of his subjects at the petition of bishop Epiphanius." A single law issued by Glycerius survives, concerning simony, dated 11 March 473 and addressed to Himilco, the Praetorian Prefect of Italy. Ralph Mathisen speculates that Glycerius tried to stay on good terms with the Eastern Roman Empire. 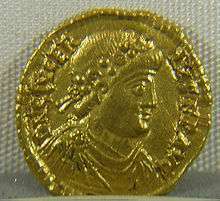 For most of his rule, Glycerius lived in Northern Italy, evidenced by the fact that the only coins issued in his name bear the mintmarks of Milan and Ravenna. In 473, Euric, King of the Visigoths, ordered the invasion of Italy, but his commander Vincentius was defeated and killed by Glycerius' comites Alla and Sindila. Despite the victorious defence of Italy, Glycerius could do nothing to prevent the Visigoths from conquering Arelate and Marseille, in Gaul. At the same time, the Ostrogoths led by King Widimir began marching to Italy. The possibility that the two Gothic armies would merge was disastrous. Glycerius sent an envoy to Widimir and, through a combination of diplomacy and a bribe of 2,000 solidi, convinced Widimir that the territories he wanted were already occupied by the Visigoths and that he should move to Gaul. While this strategy prevented Vincentius from receiving reinforcements, it also led to the convergence of both Gothic armies against Gaul. The Eastern Roman Emperor Leo I had not recognised Olybrius and did not recognise Glycerius, as his election had not been ratified by the Eastern court, and it was suspected that he was a puppet of Gundobad. Therefore, Leo chose a candidate on his own, Julius Nepos, Magister militum in Dalmatia and related to the Eastern Empress Verina. The election was delayed, however, so Julius Nepos could not leave immediately, as the ports were closed for the winter. Leo I died in January 474 and was succeeded by his grandson, the young Leo II, who chose his own father Zeno as co-emperor after a short time. Zeno continued the official position of Constantinople to deny any recognition of Glycerius, whom the court continued to view as a usurper. Regardless, Glycerius tried to reconcile with the Eastern court or, at least, to avoid conflicts with it. For example, he did not choose a second Consul in order to allow Leo II to be Consul alone for the year 474. In spring 474, the ports re-opened and Julius Nepos crossed the Adriatic Sea to Italy to depose Glycerius. Glycerius probably left Ravenna for Rome to resist the invader; he had a silver coin minted in Rome, claiming himself as Emperor together with Leo II and Zeno, and not recognising Julius Nepos. However, Julius Nepos disembarked at Portus in July 474 AD and deposed Glycerius without a fight. Glycerius was sent to Dalmatia as Bishop of Salona, serving a religious life until his death. Glycerius' deposition was thus without any bloodshed, and historians investigated the possible reasons why the Western Emperor, who had Gundobad and his army at his command, did not try to resist. One possible reason is that Glycerius' elevation, not recognised by Eastern court, received the support of neither the Roman Senate nor the Gallic-Roman aristocracy; resisting Nepos without the support of the Senate would have been a bad choice for Gundobad. It is possible that Gundobad, who was absent from Italy when Glycerius was deposed, had gone to Gaul to gather some more troops or to receive the legacy of his father Gundioc as King of the Burgundians, thus effectively leaving Glycerius alone. Glycerius took up residence at Salona, to which Julius Nepos retreated in 475 in the face of a coup attempt by Magister militum Orestes; Nepos was still in Salona in 476 when Orestes' son, the usurper Romulus Augustus, was deposed by Odoacer, King of the Heruli. The historian Malchus maintains that in 480 Glycerius was a member of the conspiracy that led to the death of Emperor Nepos and thus sought the favour of Odoacer; however, the appointment of Glycerius to the prestigious rank of Bishop of Milan, which would support the theory of the collaboration between Glycerius and Odoacer, is usually considered a rumour. It is assumed that Glycerius died at Salona. ↑ Béranger, Jean, L'abdication de l'empereur romain: Comptes-rendus des séances de l'Académie des inscriptions et belles-lettres, (1979, Vol. 123, No. 2), pgs. 357-379. However, the Prosopography of the Late Roman Empire does not mention the name Flavius for him, and it may not be contemporary. ↑ The mid-sixth-century historian Jordanes made it clear that as far as the eastern court was concerned, Nepos was the direct successor of Anthemius: "After Anthemius had been killed at Rome, Zeno, through his client Domitianus, named as emperor at Ravenna Nepotianus' son Nepos, who had been joined in marriage to his niece. Nepos, having taken legal possession of the Empire, deposed Glycerius, who had imposed himself upon the Empire in a tyrannical manner, and made him bishop of Salona in Dalmatia"
↑ Ennodius, Vita Epifani, 79; translated in Sr. Genevieve Marie Cook, The Life of Saint Epiphanius by Ennodius: A translation with an introduction and commentary (Washington: Catholic University of America, 1942), p. 63. ↑ O'Flynn, John Michael, Generalissimos of the Western Roman Empire, University of Alberta, 1983, ISBN 0-88864-031-5, p. 130. Catalogue of late Roman coins in the Dumbarton Oaks Collection and in the Whittemore Collection: from Arcadius and Honorius to the accession of Anastasius, (1992). Cook, Sister Genevieve Marie (1942). The Life of Saint Epiphanius by Ennodius: A translation with an introduction and commentary. Washington: Catholic University of America. Jones, A. H. M.; Martindale, J. R. (1980). The Prosopography of the Later Roman Empire. vol.II: AD395-527. Cambridge University Press. Mathisen, Ralph W. "Glycerius (3/5 March 473 – June 474)". De Imperatoribus Romanis. Meijer, Fik (2004). Emperors Don't Die in Bed. Routledge. ISBN 0-415-31201-9. Norwich, John Julius (1990). Byzantium: The Early Centuries. O'Flynn, John Michael (1983). Generalissimos of the Western Roman Empire. University of Alberta. ISBN 0-88864-031-5.